Great news: If you’re looking to cross New Year’s Eve in Times Square off your bucket list this year, you may not have to camp out all day in a Snuggie with a backpack full of bologna sandwiches. 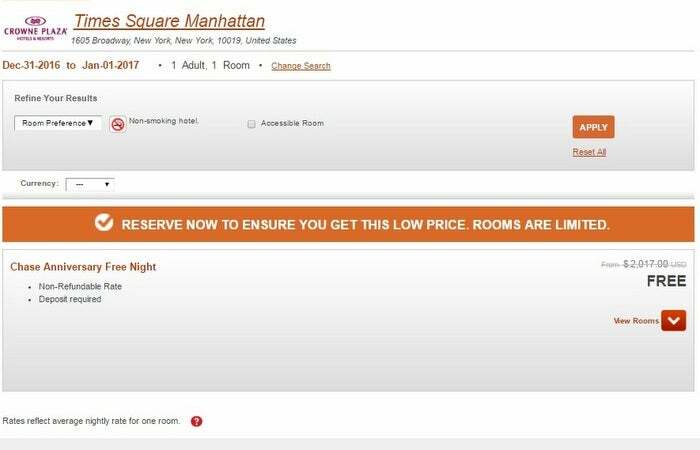 At least a handful of rooms at the Crowne Plaza Times Square Manhattan are somehow still available for the Chase Anniversary Free Night benefit from the IHG Rewards Club Select Credit Card. Rooms are also available for 50,000 IHG Rewards points, which translates to a redemption value of 4.0 cents per point — way above TPG’s most recent valuation of 0.7 cents. 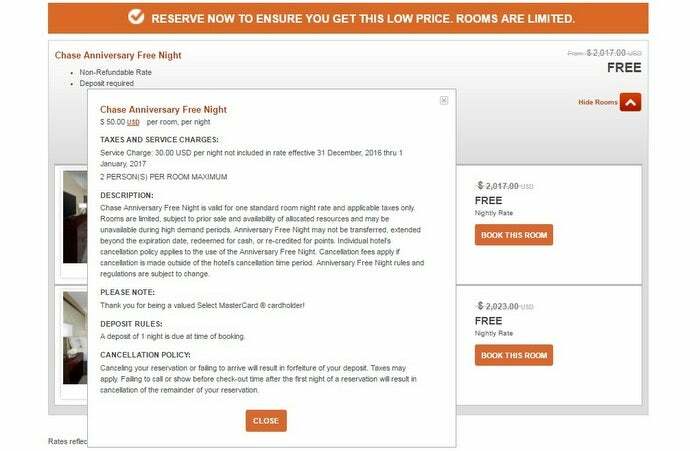 If you were paying cash, by the way, the same standard room would run a whopping $2,017 on New Year’s Eve. A $2,017 room for free with Chase Anniversary Free Night? Yes, please! The IHG Rewards Card is a great way to earn free nights at hotels around the world, especially since the Chase Anniversary Free Night perk — which is good at any IHG hotel — easily covers the $49 annual fee and is reason enough to keep the card in your wallet. This may be the best redemption value we’ve seen for the anniversary free night, although it’s no secret there are plenty of IHG properties where you can score an amazing value from this card benefit alone. As with any amazing deal, there are a few things to keep in mind. The Chase Anniversary Free Night only covers a stay in a standard room, so you probably won’t have an iconic view of Times Square from your window — and the IHG Platinum Elite status that comes with the card likely won’t get you an upgrade on NYE. However, the Crowne Plaza Times Square Manhattan does reserve a special area outside the hotel exclusively for its guests, so you won’t be packed in with the millions of outsiders lacking food, drink and bathrooms all day waiting for that ball to drop. Only book this night if you are sure you won’t cancel. Another important note: the cancellation policy for this date states that a cancellation or no-show results in the forfeiture of the deposit of one night at the hotel. Translation: if you don’t use your reservation for any reason, your credit card will be charged the full room rate of $2,017 and the free night will be deposited back into your account. I questioned this several times with the reservations agent, and she confirmed the policy each time. If you book this room with the Chase Anniversary Free Night and do show up, however, the free night credit will be used and your stay will be free. Just to clarify — if you book and cancel (or are a no-show), your free night credit will not be used and you will be charged the full rate of the room. It would take a hotel manager to override this policy, so it’s best not to chance it. If your plans are set for New Year’s Eve in NYC and you want to be there for the big ball drop in Times Square, follow these steps to book your free room. Unfortunately, if you don’t have the IHG credit card yet, the free night only kicks in on your account’s anniversary, so you’ll miss out on this opportunity in 2016 — it’d be smart to get the card now though so you don’t miss out on the next one. Featured image courtesy of Crowne Plaza Times Square Manhattan.